En 1945 el E 50 fue concebido como el carro medio estándar de la Panzerwaffe para reemplazar al Panther y Panther II. Solo existió en anteproyectos. Following the Panther series of tanks, the E-50 was designed as a support tank. It is basically a Panther II with more horsepower and armor. These upgrades give it increased survivability in a close-quarters battle. Just like the Panther II, if you get in a dogfight ramming is a viable tactic because of your tank's weight, so you can potentially do a lot of damage. Consider this option a last resort however, as your tank is relatively slow to turn and unwieldy. Able to use 3 of the 4 most accurate guns in the game, the 7.5 cm KwK 45 L/100, 8.8 cm KwK 46 L/100 and 10.5 cm KwK 45 L/52 Ausf. B, you can either play this tank as a long-range sniper, or a medium range support tank. Fully upgraded your choice between the high damage, but slow firing 10.5 cm and the lower damage faster firing 8.8 cm is mostly a matter of personal preference and play style, but the 10.5 cm does edge out the 8.8 cm on damage per minute as well. Good gun accuracy and aim time. Excellent upper front plate (around 300mm effective). Because of the weight, tank is slow to stop. Turret armor can be easily penetrated. The E-50 is a massive improvement over the Panther II in terms of survivability, maneuverability, and Damage, if you play it correctly. It is still not a heavy tank, but it can last a minute or two going up against tier 8, 9 and sometimes 10 heavies. Always try and turn your hull so you're not 90 degrees to the enemy attacking, the German medium hulls are great for bouncing angled shots if the enemy is just shooting at the largest target; which is usually your hull. The 8.8cm L100 is great for sniping, and you should use that to your advantage in long distance standoff fights with heavies as you can still make critical hits at 500m and more with a competent gunner, this will improve with the 10.5cm's increased damage. A nice fast shell speed goes with the 88/L100 so hitting moving scouts is easy and it has half decent damage output even against heavy tanks, but don't expect to win a 1 on 1 head on. Using the speed of the E-50 and its maneuverability will win you many tank on tank battles as it has decent acceleration but is hampered by slow track turn speed. Most players either look at you as a very low HP heavy tank, or a slow fat Medium tank, use it to your advantage and flank them while they ignore you or think you've run away. When you unlock the 10.5cm L/52 you'll see a significant performance improvement against heavy tanks with the increase penetration value, and negligible drop in accuracy. With the top components unlocked and installed and a proper Player you are a force to be reckoned with on the battlefield. Grinding the engine first gives the tank a needed boost in the acceleration, which improves your chances to evade artillery fire and improves the ability to successful flanking enemy's. However, grinding the 88/L100 while tedious, will grant you a gun that can penetrate tier 10 tanks more reliably, and lessen the burden for future grinding. The E-series designs were simpler, cheaper to produce and more efficient than their predecessors; however, their design involved only modest improvements in armor and firepower over the designs they were intended to replace, such as the Hetzer, Panther G or Pz.Kpfw. Tiger II, and as such represent the eclipse of German armored vehicle design by such tanks as the American M46 Patton, the British Centurion Mk 5/2 and Soviet T-54 tanks, which would have been the Entwicklung Series' contemporaries and likely opponents. The E-50 Standardpanzer was intended as a standard medium tank, replacing the Pz.Kpfw. V Panther and Tiger I and the conversions based on these tanks. The E-50 hull was to be longer than the Panther; in fact it was practically identical to the King Tiger in overall dimensions except for the glacis plate layout. 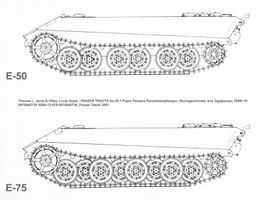 Compared to these earlier designs however, the amount of drilling and machining involved in producing these standardpanzers was reduced drastically, which would have made them quicker, easier and cheaper to produce, as would the proposed conical spring system replacing their predecessors' complex and costly dual torsion bar system. As indicated by its name, the weight of the E-50 would fall between 50 and 75 tonnes. Its maximum speed was planned as 60 km/h. Only blueprints were made; no production models were produced.